Can you transmute energy like a carrot seed? Ever doubt magic? Here’s some real life magic. That little teeny weeny seed gets planted, it transmutes the energy of the water and dirt, expands it, changes the colors, and makes it sweet and crunchy AND builds nutrients into it so we in turn can use it. 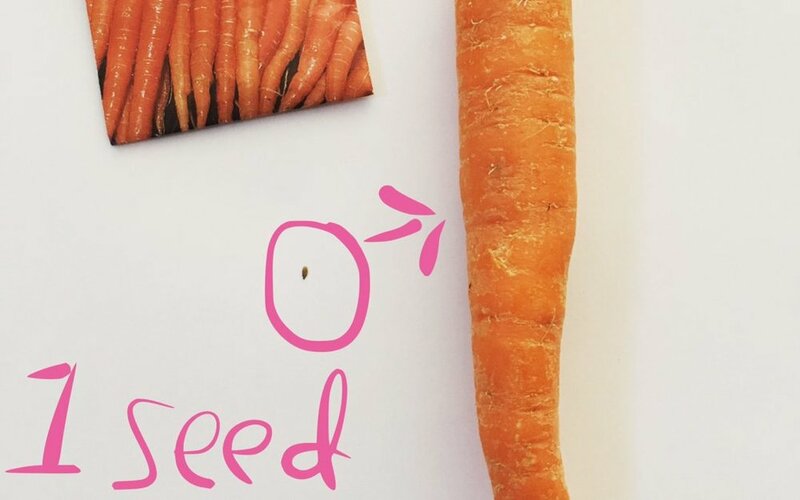 That carrot came from that TINY little seed!! When you get out of your mental mind and just be in awe of this insanely magical occurrence, life takes on WAY more possibility. If a seed transmutes energy that massively and it occurs all the time in nature and you are nature… then why can’t you? Where are you limited? This is something we explore in The Change Militia … this morning I suggested we start calling it Energy School or Magic School Before I understood how I use, generate, waste, restore my energy I was much less efficient with my choices. Now, when I engage with others in any situation I am curious about what is going on. As a result, life has become lighter and much more fulfilling because I can choose to take action aligned with my intentions, in ways that generate more energy for me. You gain energy from food, other people, your environment, movement, etc but if you don´t know how to metabolize the endless influx of energy available at all times, you can´t use it. AND most people unknowingly spend tons of energy trying to resist all that incoming energy and fuel resulting in feelings of stress, overwhelm, and stuck. When you understand how to use your energy and that around you, you can let go of drama and limitations and create from a really fun and powerful place. You can stop wasting your energy and start cultivating it. It´s not "woo-woo" to create with energy – that´s what seeds do! It's science and that is what Jeff has really done, help me and the others members understand how to metabolize more energy and use the energy to create what we want. It´s just like the seed that turns into the carrot. It´s magic but there is also logic around it all and everyone can access it when they know how and practice. It is explainable in a way that our mind can understand.